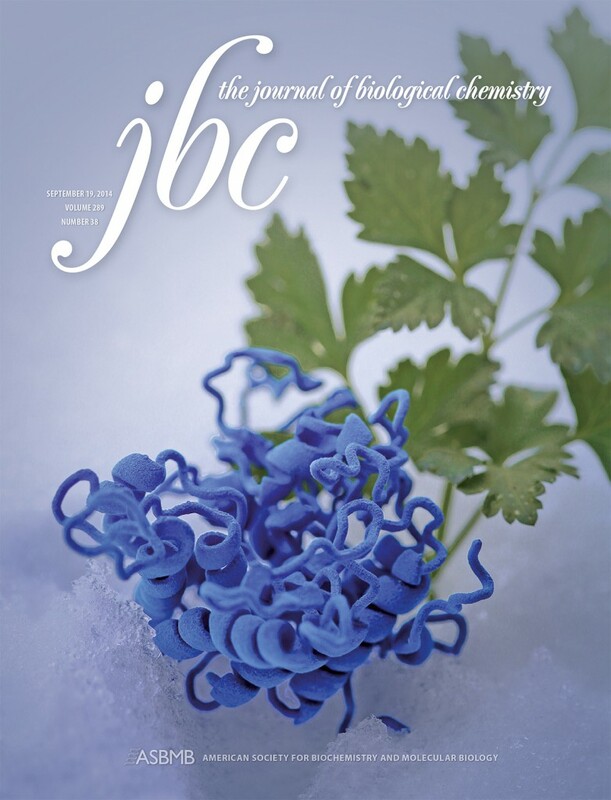 On the cover: The cover is a photo of a physical model of SENSITIVE TO FREEZING 2 (SFR2) in blue next to parsley in the snow. The parsley and snow are representative of the role of SFR2 in protecting plant chloroplasts from freeze damage. For details see the article by Roston et al., pages 26089–26106. Rebecca Roston, Kun Wang, Leslie A. Kuhn and Christoph Benning. 19 Sept. 2014. Structural Determinants Allowing Transferase Activity in SENSITIVE TO FREEZING 2, Classified as a Family I Glycosyl Hydrolase. Journal of Biological Chemistry 289(38), p. 26089-26106. Rebecca Roston is an assistant professor of biochemistry.